Venture capital opportunities for Northwest hi-tech companies funded by Technology Alliance, a statewide network of businesses, research institutions, and industry trade associations. Genealogical information from 1.2 billion+ records. Includes U.S. Federal Census from 1790, and the American Genealogical Biographical Index. For technical support, please contact 1-800-889-3358 or tsupport@proquest.com, or visit ProQuest’s support page. *Ancestry is available on personal devices from within the library as long as you are logged into the KCLS wifi. Easy access to business laws in Washington State from lawforWA.org. Video workshops on tax topics for Washington State businesses, from the Washington State Department of Revenue. A short video on business planning from the Washington State Small Business Development Centers Network. A U.S. Small Business Administration business planning web presentation from Palo Alto Software. Information about diseases, conditions, wellness, travelers health, and emergency preparedness from the CDC. Searchable recommendations on editorial style and publishing practices for the digital age including the Chicago Q & A, tools such as sample correspondence and proofreaders marks, and a quick citation guide. For technical support, please contact cmosonline@press.uchicago.edu or 1-877-705-1878. Automotive diagnostic and repair information for domestic and foreign vehicles including vehicle maintenance tables, step by step repair procedures, repair labor estimating tool, vacuum and wiring diagrams, and ASE test prep quizzes. America's historic newspaper pages from 1836-1922 and U.S. Newspaper Directory of American newspapers published between 1690-present, chronicling America is sponsored jointly by the National Endowment for the Humanities and the Library of Congress. Directory of city and county municipal codes with links to individual city websites, from the Municipal Research and Services Center. Product reviews, product ratings, product buying advice, and articles from the latest issues of Consumer Reports. For technical support contact this service directly from Ebsco's support page. Review and rating information about consumer products. Comprehensive listing of genealogical resources containing links to ethnic group sources, how-to articles, country/geography resources, and more than 200 other categories. Accurate and reliable health information for patients, caregivers and consumers from over 500 medical journals and magazines, books, reports, blogs, and websites on topics such as ADHD, aging, women’s health, food and nutrition, midwifery, and PTSD. Includes Psychology Today, Family Health, Men’s Health, Working Mother, and more. For technical support, please contact 1-800-889-3358 or tsupport@proquest.com, or visit ProQuest’s support page. Historical records, including many with digitized images; save and share your family tree; order microfilmed records to view in a local Family History Library; find tips and resources using the Research Wiki; and much more. Government documents that provide public information about the workings and essential activities of the Federal Government. Guide to creating financial projections for your startup from About.com. Information on business law topics from Nolo Press. Answers to frequently asked questions about genealogy resources. Direct links to individual newspapers for focused Google News Archive searching. Congressional Record, Federal Register, Bills, legislative calendars, and other searchable government documents. Articles on business growth from Entrepreneur magazine. Interviews with prominent business leaders on innovation. Fully-indexed U.S. Census, local and family history collection, Revolutionary War records, Freedman’s Bank records, U.S. Serial Set, and more. For technical support, please contact 1-800-889-3358 or tsupport@proquest.com, or visit ProQuest’s support page. Over 500 documentary, educational, and lecture videos covering cooking, photography, language learning, and travel. Listings for over 700,000 manufacturers and suppliers. Small loan assistance for refugees. Place holds, manage your account. One-tap access to eBooks, and downloadable audiobooks from OverDrive on your mobile device or eReader. For technical support, visit OverDrive's Libby Help page. Information about diseases, conditions, and wellness issues in language you can understand, from the National Library of Medicine. Vast array of records held by the National Archives, including military service files, immigration and arrival records, land records, and more. Articles, guides, and case studies for small businesses. Primary sources to assist with genealogy research. Regular email alerts highlighting new titles in over 20 genres and subjects. Tools developed by Stephen P. Morse to simplify searches in several websites, including the Ellis Island and Castle Garden passenger lists. Combined coverage from over 30 Puget Sound community newspapers. Full view newspapers from 120+ countries with 60+ languages represented. Newspapers include up to 3 months of back coverage. For technical support, please visit PressReader's support page. 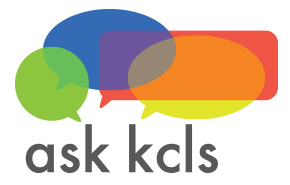 Even if you are in a KCLS library/using KCLS WiFi, please click on “Sign in” on the upper right corner of the PressReader site, select the library card icon, and enter your library card barcode number and PIN for full access to the site's content. Select King County Library System as your library. You will see a green coffee cup icon on the top left side of the PressReader site when you are logged in. This database, formerly called PILOTS, is produced by the U.S. Department of Veterans Affairs National Center for PTSD. The database provides citations and abstracts to the worldwide literature on PTSD and other psychological effects of trauma. If you have a disability and find an article you would like to read that is not yet accessible, please contact ncptsd@va.gov and they will provide you with a 508 accessible copy. For technical support, please contact 1-800-889-3358 or tsupport@proquest.com, or visit ProQuest’s support page. Find legal forms, research guides, podcasts, services and more. Small business news from the Reuters news agency. An overview of Marketing from the Small Business Administration. Large scale maps of Washington cities and towns from1867-1970, detailing street blocks and building numbers. For technical support, please contact 1-800-889-3358 or tsupport@proquest.com, or visit ProQuest’s support page. Financial assistance programs from the Small Business Association. Free downloadable application used like Legos to code online. Resources for starting and running your own small business, from the U.S. Small Business Administration. A collection of online business ratio calculators from Bankrate.com. IRS forms, publications, videos, and articles for business owners. Manufacturers and suppliers in over 67,000 categories. Business and economic data from the U.S. Census Bureau. Low or no-cost legal services for entrepreneurs and nonprofits. State and county genealogy websites developed by volunteers. Coverage of news pertaining to small business success. Access to historical Washington State newspapers through the Washington State Library. To access some of these resources you may need a Washington State Library card. Articles from the Washington Post (1987-present). Tip: To see the most current complete articles, do an "Advanced Search," search by publication date and specific date range (enter the current date - current date), and select "Full Text" only. For technical support, please contact 1-800-889-3358 or tsupport@proquest.com, or visit ProQuest’s support page. Consumer tips, plus instructions for resolving consumer complaints. What to do if you have lost your job. Volunteer-based site that aims to provide an information page for every country in the world. Precise, powerful search of books, articles, dissertations and theses, eBooks, government documents, art museum images, and other print and electronic resources from hundreds of libraries around the world. A small business blog from The New York Times. Detailed information about the performance of over 24 million active businesses.